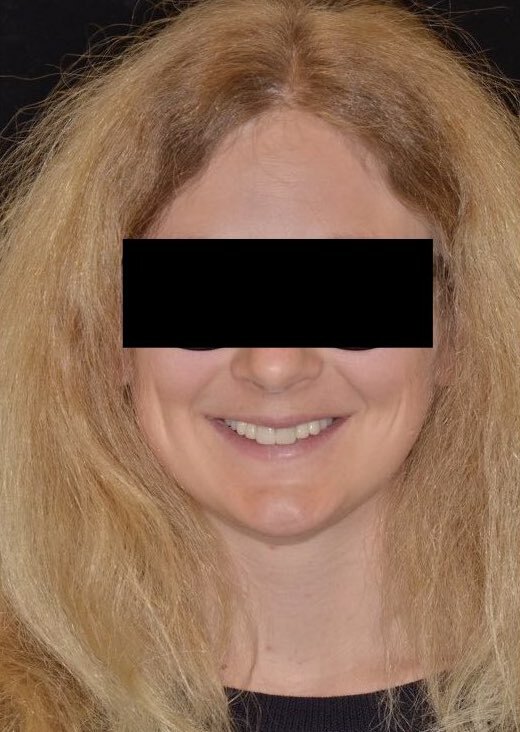 A 18-year-old female patient diagnosed with Ectodermal Dysplasia at a young age. She presented: 10 aplasias in the upper jaw, 11 aplasias in the lower jaw, 14 Primary teeth persisting, 6 in the upper jaw and 8 in the lower jaw, low smile line, deep bite, overerupted upper central incisors, and small apical base. 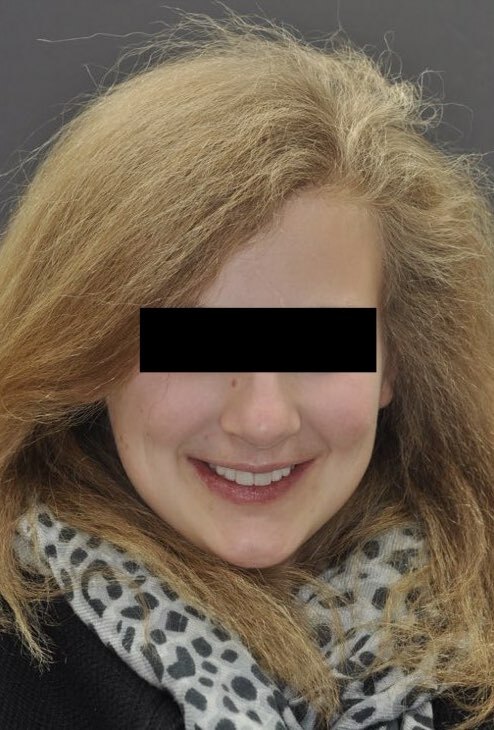 Going through her puberty with removable prostheses the patient now asks to start implant treatment in the upper jaw. The surgical solution was: extraction of primary teeth with simultaneous bone augmentation, wait for 4 months healing period. Implant placement regio #13, #14, #15, #23, #24, #25 FDI (#6, #5, #4, #11, #12, #13 US). 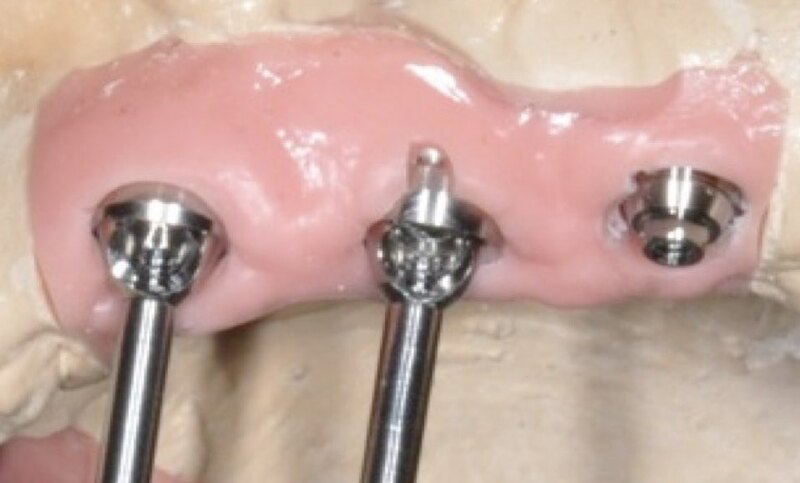 Then 6 months healing period, abutment surgery with the connection of angulated and straight Multi-Unit Abutments (MUA). During the restorative treatment plan for the provisional phase was: Elbrecht stent. 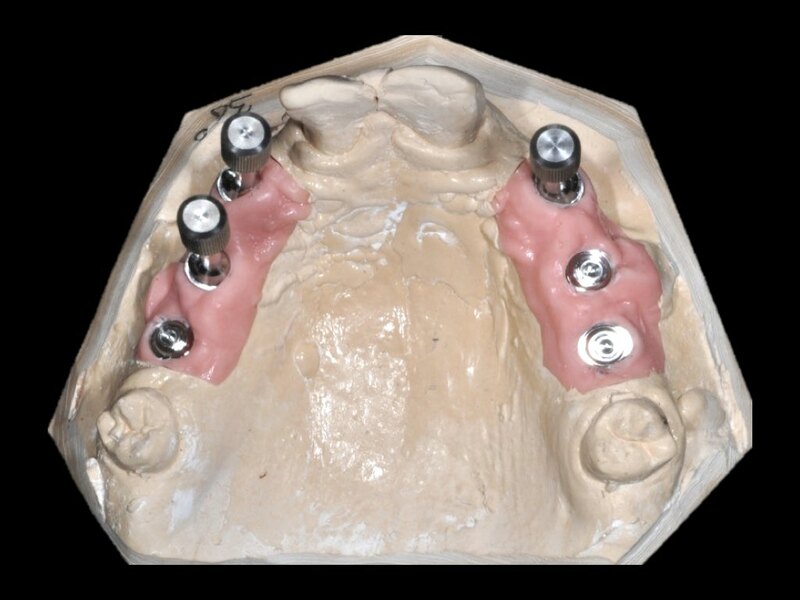 And in the definitive solution: Nobel Procera ®Implant fixed partial denture Zirconia 1st and 2nd quadrant. IPS e.max Press crowns #11 and #21 FDI (#8 and #9 US). 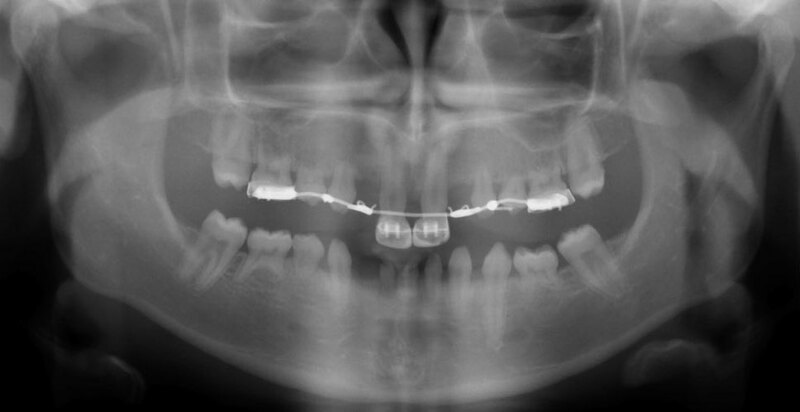 Panoramic radiograph at 15-years of age. Diagnosis: Multiple aplasia due to Ectodermal Dysplasia. All existing permanent teeth fully erupted. #11 and #21 FDI (#8 and #9 US) elongated. Splinted. Persisting primary teeth #55, #54, #53, #63, #64, #65, #85, #84, #83, #81, #71, #72, #73, #75 FDI (A, B, C, H, I, J, T, S, R, P, O, N, M, K US). Orthodontic bands to keep primary teeth from mesial migration. Patient 18 years old. Orthodontic prostheses removed. #11 and #21 FDI (#8 and #9 US) composite build-ups, elongated. Occlusion only on permanent molars. 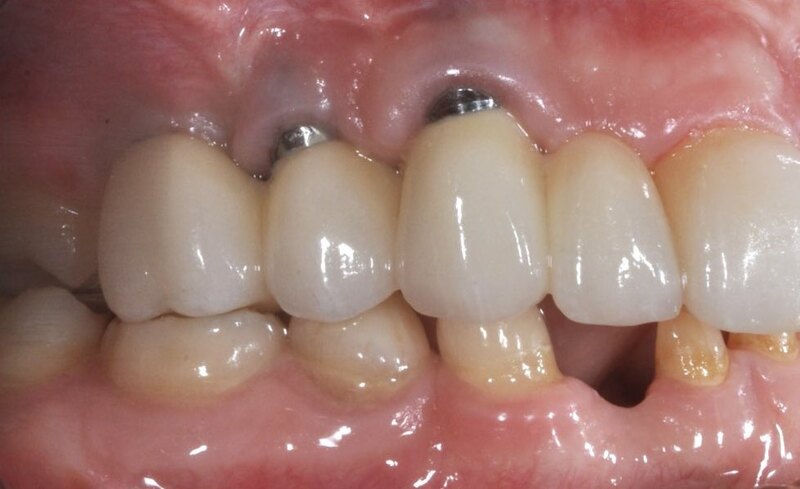 Patient considered fully somatically grown and mentally ready for implant treatment. En face picture. 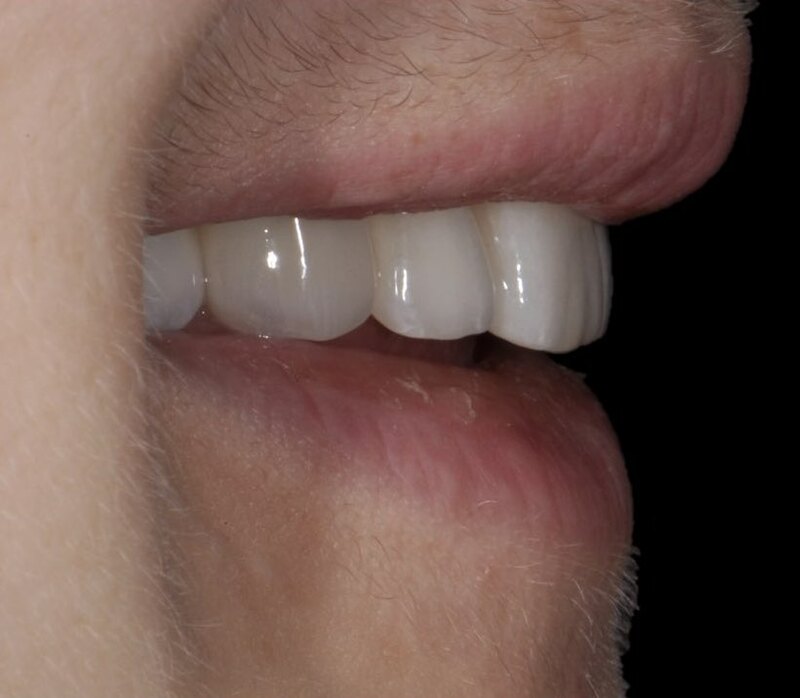 Extra oral Ectodermal Dysplasia characteristics: Hair quality. 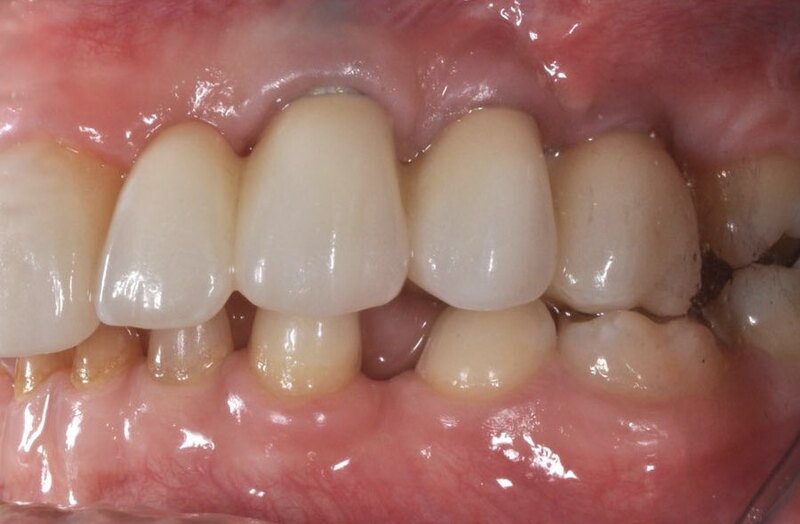 Patient considered fully somatically grown and mentally ready for implant treatment. Profile picture. 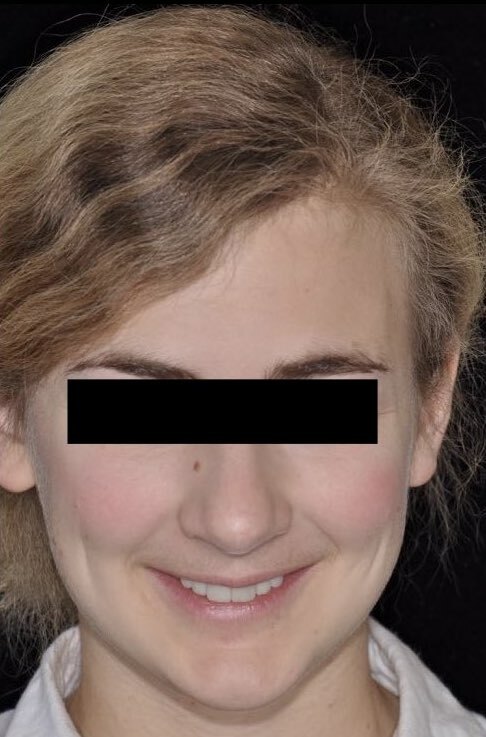 Extra oral sign of deep bite: small chin and pronounced mentolabial sulcus. Elbrecht stent used as long term provisional prosthetics awaiting somatic growth. Adjustments and exchanges of the stent has been made several times during the patients years of growing. 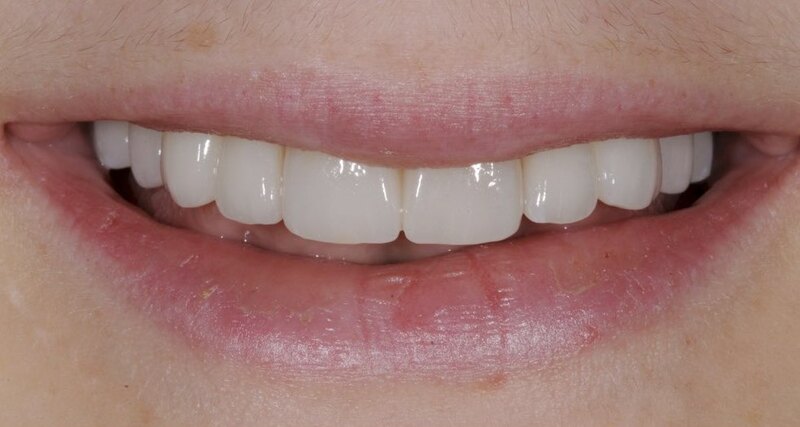 Clinical picture with occlusal view of Elbrecht stent. Adjustments and exchanges of the stent has been made several times during the patient years of growing. Panoramic radiograph with Elbrecht stent in place. Taken for prosthetic planning. Low smile line. #11 and #21 FDI (#8 and #9 US) elongated. Retroclined teeth in upper provisional Elbrecht stent. Lack of lip support. 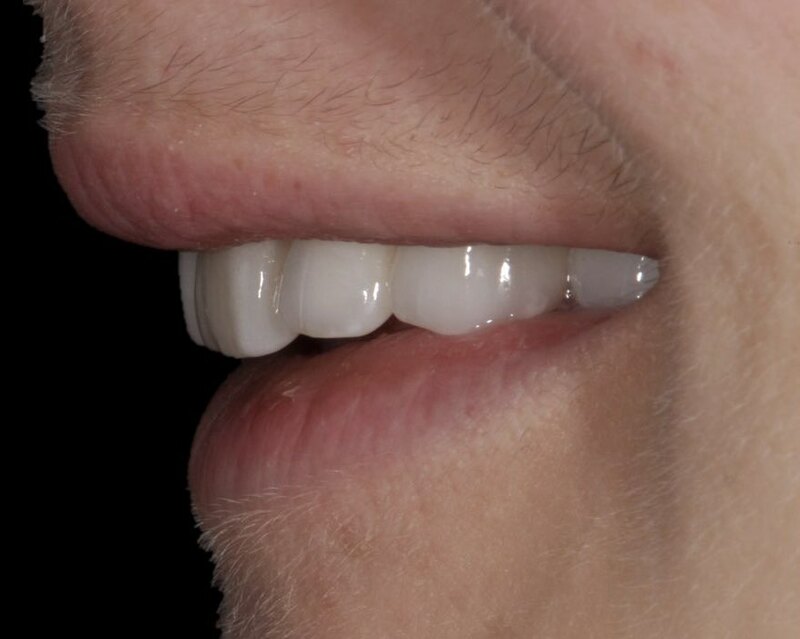 Thin contour of upper lip. Small primary lower teeth. Lower lip lack of lip support. Lower lip falling in. 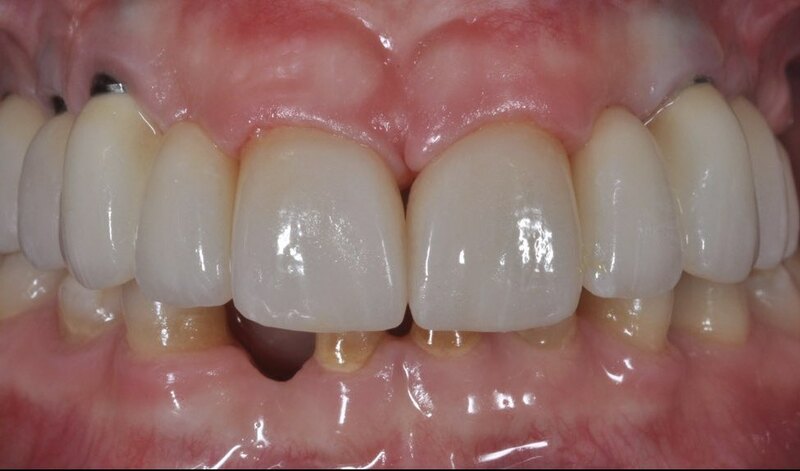 Patients wishes: Shorter central incisors Teeth to chew and smile with without worrying about them falling out. Post extraction upper of primary teeth. 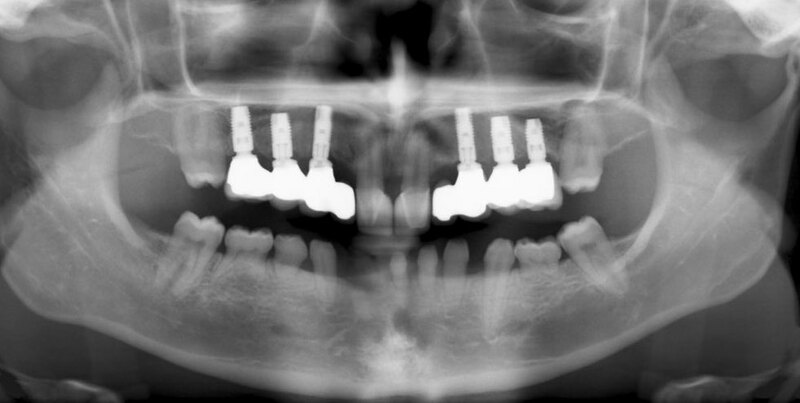 Primary teeth extracted with bone preserving procedure and simultaneous bone augmentation with Bio-oss bimaxillary in alveolas and sinuses. 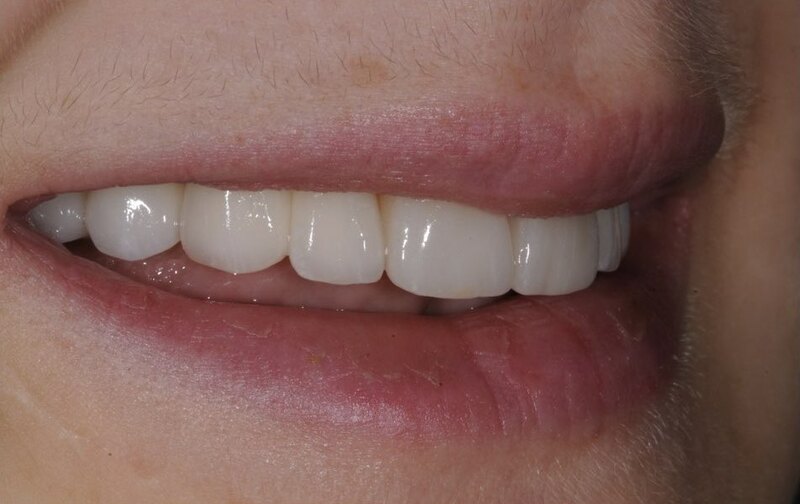 Image after 4 months healing, prior to implant surgery. Post extraction upper of primary teeth. #11 and #21 FDI (#8 and #9 US) elongated and with composite build-ups. Low lip line. Post extraction upper of primary teeth. Deep bite- small vertical space. #11 and #21 FDI (#8 and #9 US) elongated in combination with growth of the premaxilla. Implant surgery. Bucco-lingual dimensions of the crest not optimal but adequate cervically. More apically - concavity that forces the surgeon to place the implants in a buccally tilted position. Control of the tilting of the implants in the lab. 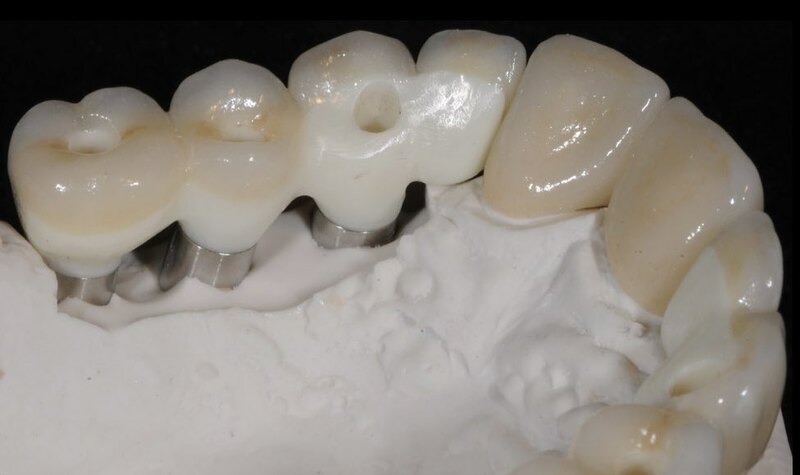 Dental technician decides the degree of angulation of the Multi Unit Abutments needed to make screw-retained and strong prosthetic constructions. 30 and 17 degrees angulated Multi Unit Abutments used in combination with straight Multi Unit Abutments. 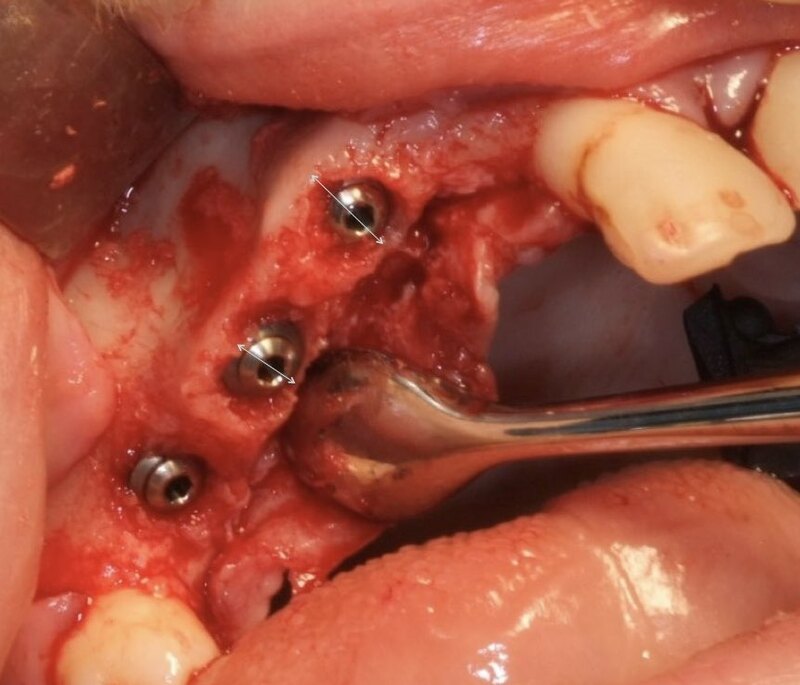 Shallow placement of implants in combination with the buccal tilting makes the titanium collar of the angulated Multi Unit Abutments visible above the mucosa. 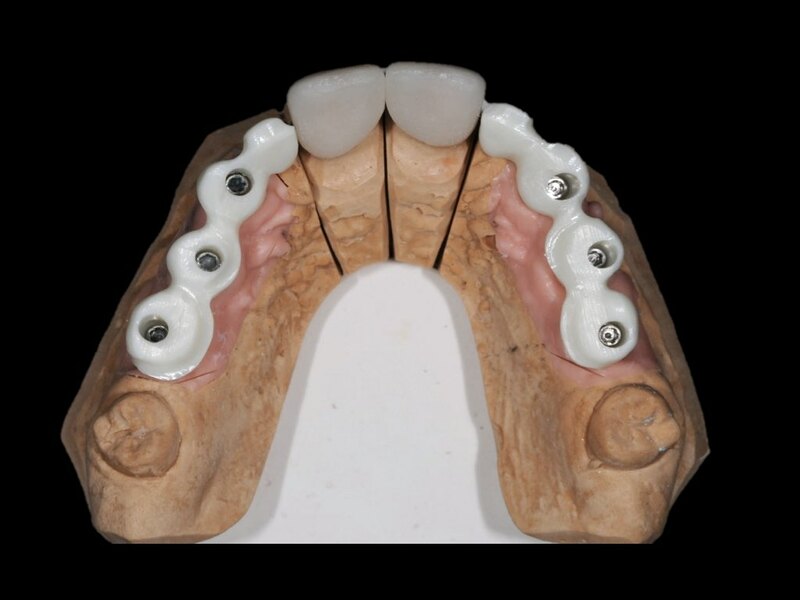 In discussion between dentist, dental technician and patient about the visible titanium collar, following are taken into consideration: Low lip line – titanium hidden under the lip. 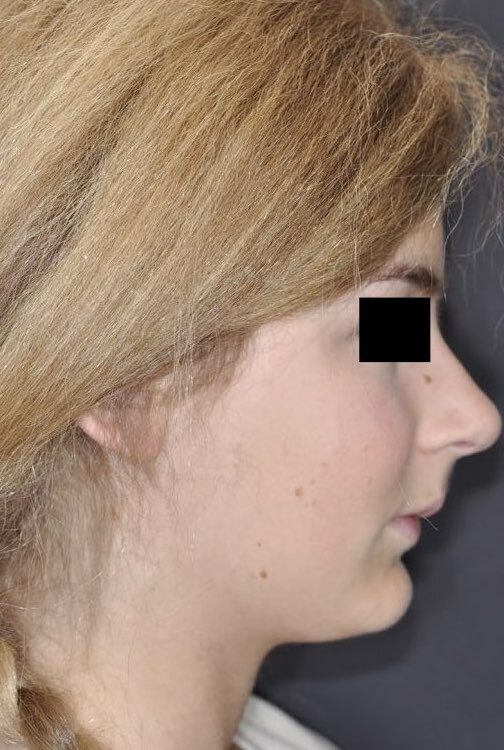 Young age – strong wish to make a screw retained reconstruction as neat and strong as possible. The best solution to reach these goals was at the time of treatment through using Procera implant fixed partial denture with Zirconia. Esthetic analysis at the lab including shade selection. After the removal of the composite the shape of the underlying teeth is revealed. 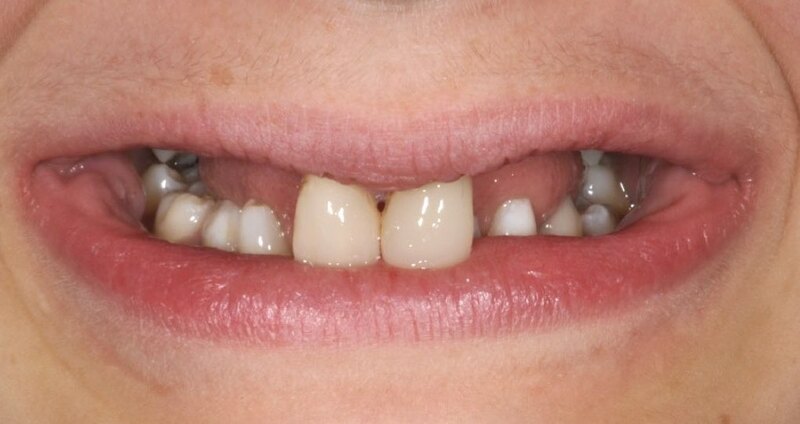 Peg shaped incisors are very specific for patients with Ectodermal Dysplasia. Teeth fully covered with enamel. 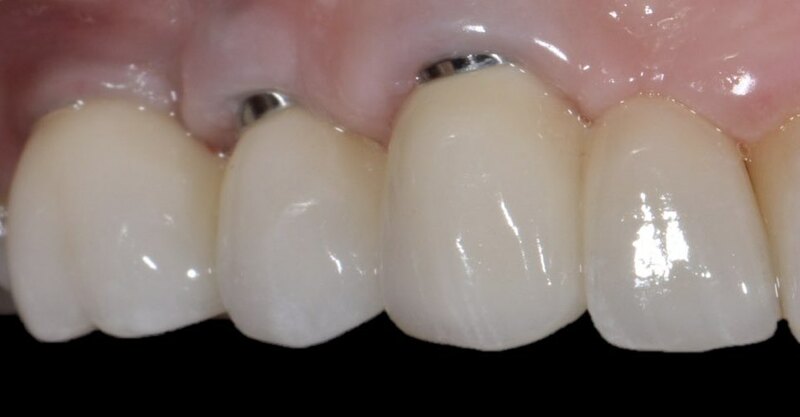 Very good condition to make bonded full ceramic crowns on. 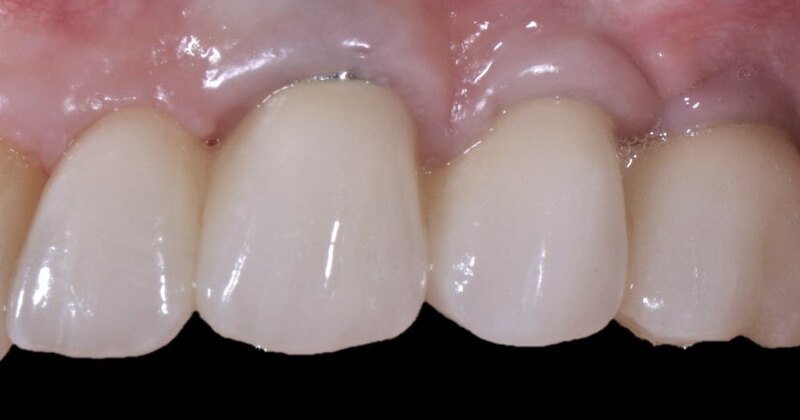 When working with transparent full ceramic crowns it is crucial to give the information about stump color to the dental technician. 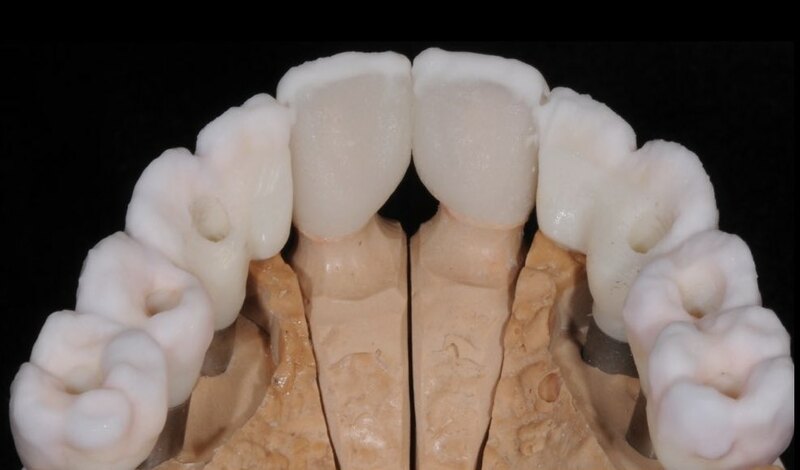 Intra oral try-in of fixed partial dentures over implants in white wax to examine the esthetics and function. Length of teeth, lip support, occlusion and articulation are being evaluated. 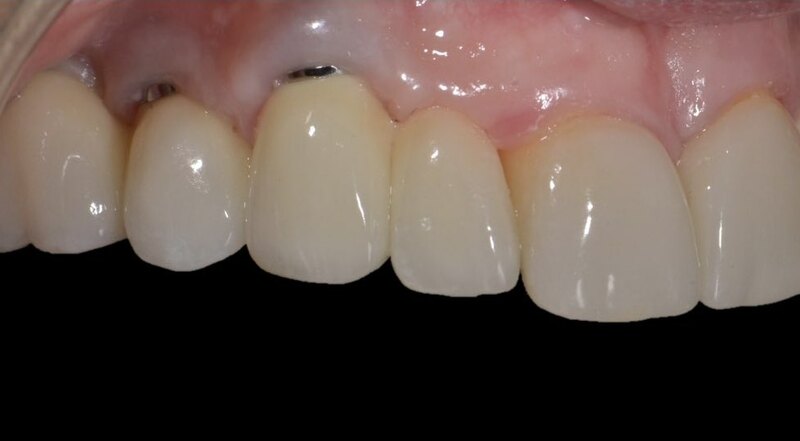 Zirconia fixed partial dentures and IPS e.max Press crowns. 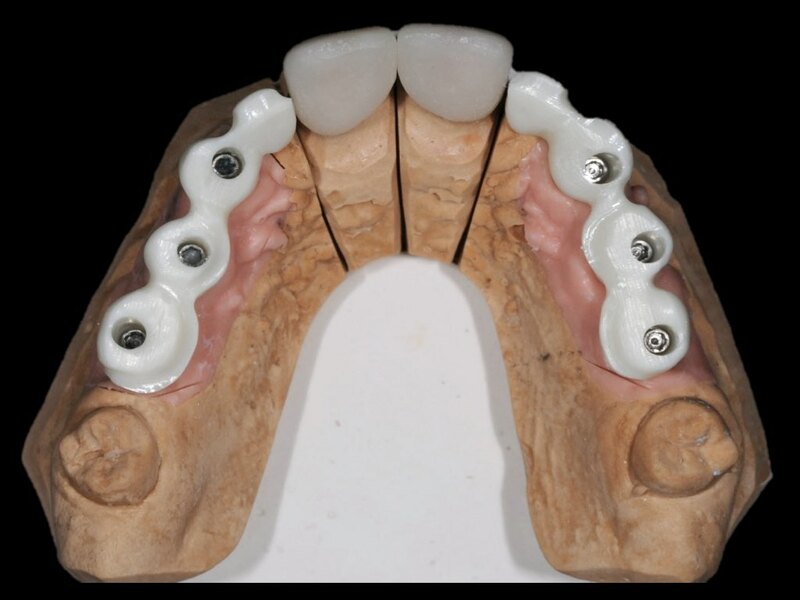 Framework design: Palatal collars to give axial support to the surface ceramics. Anatomic design for an even layer of the surface ceramics. 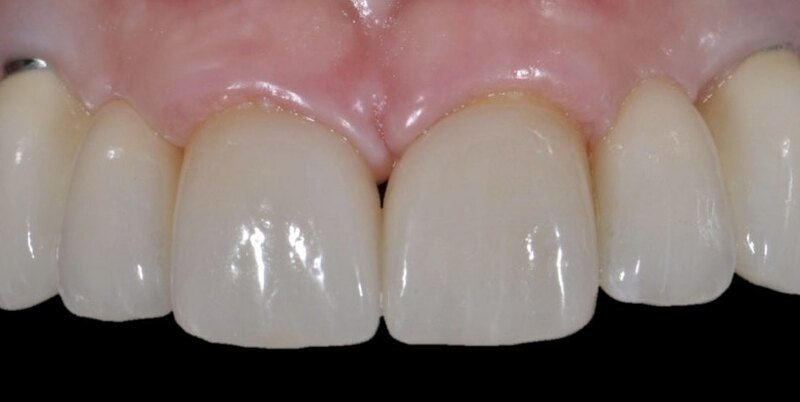 IPS e.max Press crowns designed with buccal cut-backs for better esthetics. Framework design. 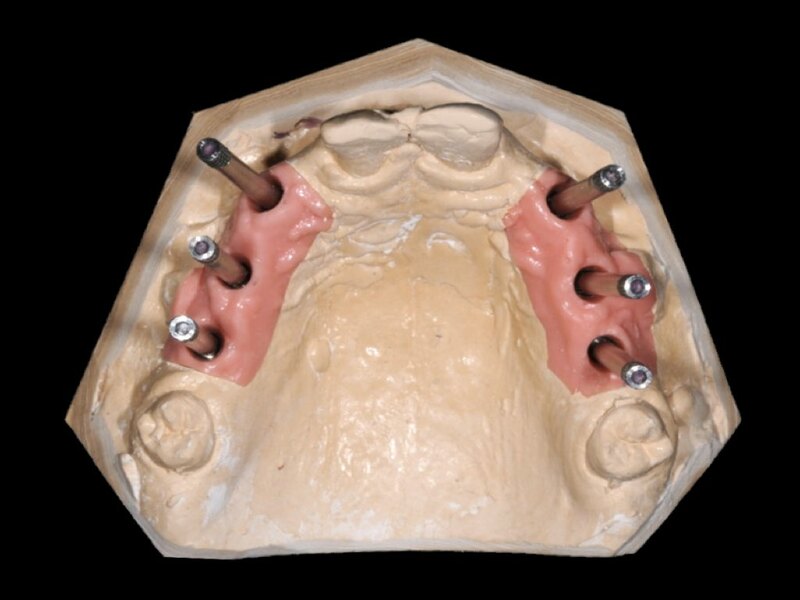 Palatal collars to give axial support to the surface ceramics and to make the zirconia framework as strong as possible. Anatomic design for an even layer of the surface ceramics. Surface ceramics: Different framework material. Use of a ceram compatible with both framework materials to make it easier to match texture, shade and gloss. Divergence of #11 and #21 FDI (#8 and #9 US) makes the space in between them very big. More ideal would have been if they were more parallel and if #11 FDI (#8 US) was more mesially tilted. 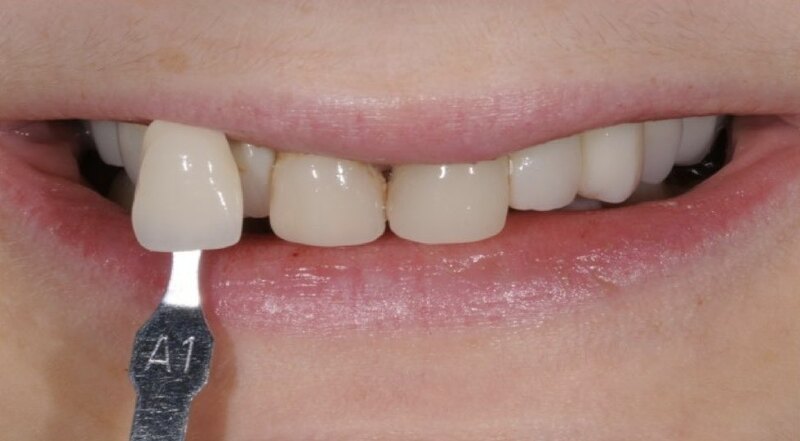 Due to this the dental technician has to work hard not to make #11 and #21 FDI (#8 and #9 US) look too wide. Surface ceramics and shape of crowns. Result with the ceram compatible with both materials to make it easier to match texture, shade and gloss. 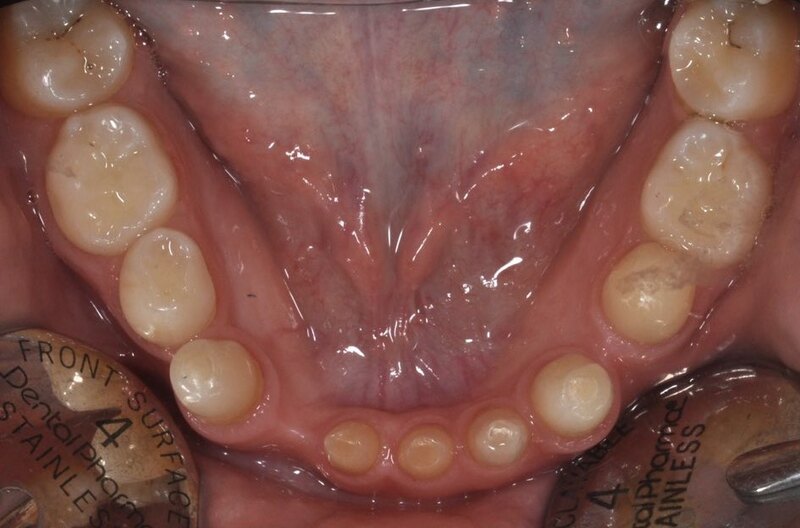 Great challenge to shape the tooth supported crowns. Hard not to make them look too wide. Only teeth in position #46, #33 and #36 FDI (#30, #22 and #19 US) are permanent. 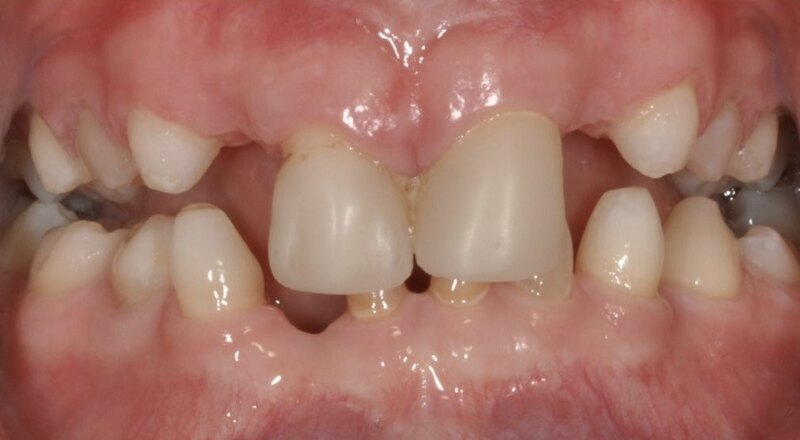 Care is taken to plan the occlusion and articulation not to overload the small primary teeth in the lower jaw. Hard to get an optimal balanced occlusion and articulation. This adds even more importance to the design of the framework that needs to be extra strong in the sites of great loading in occlusion and articulation. Clinical result. 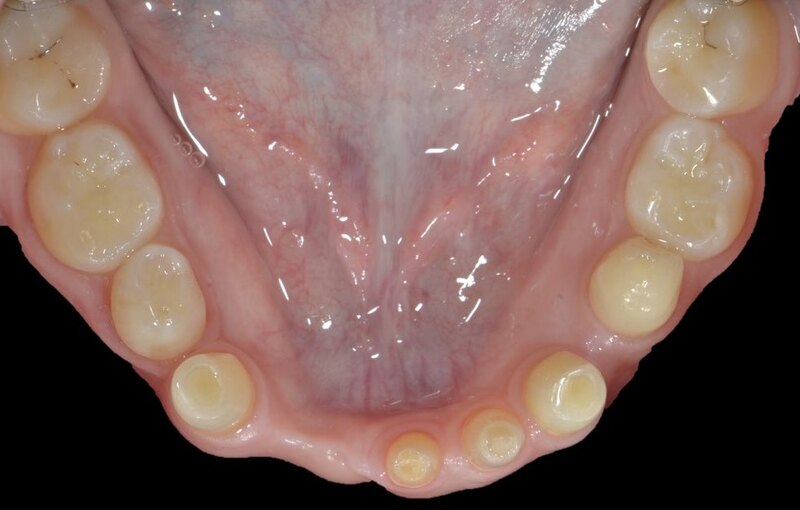 Black triangle between #11 and #21 FDI (#8 and #9 US) not possible to get rid of due to a defect in the gingiva. Titanium visible above the mucosa in position #13 #14 FDI (#6, #5 US) and #23 FDI (#6 US). Clinical result, first quadrant. Titanium collar of angulated Multi Unit Abutments clearly visible #13, #14 FDI (#6, #5 US). 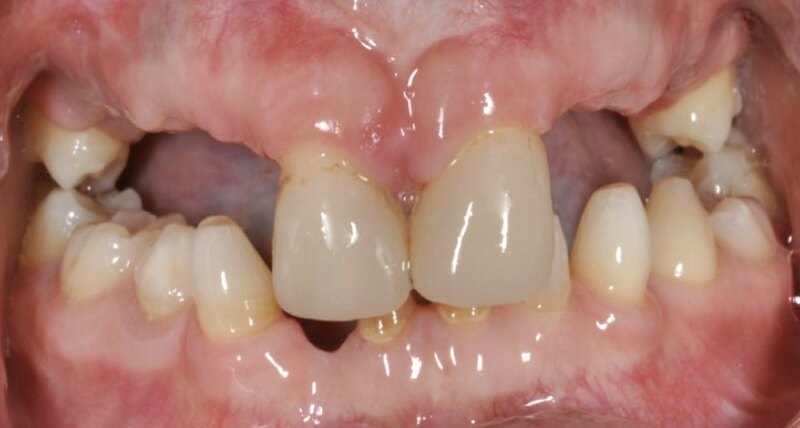 Grey shading on the buccal mucosa due to thin buccal bone, buccal tilting and shallow placement of the implants. Tooth in position #16 FDI (#3 US) not in full occlusion. Awaiting elongation. Clinical result, second quadrant. Titanium collar of angulated Multi Unit Abutment slightly visible #13 FDI (#6 US). Clinical result. 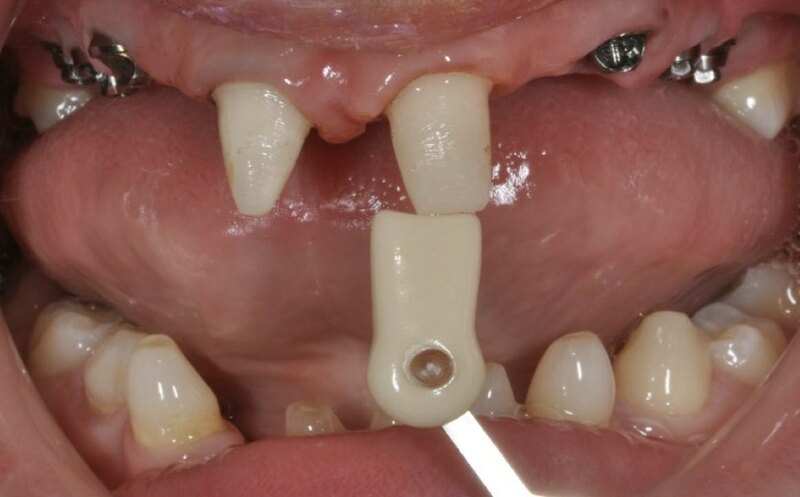 The patients low lip line hides: Black triangle between #11 and #21 FDI (#8 and #9 US), supra mucosal titanium abutments, grey shading on the buccal mucosa. Clinical result. 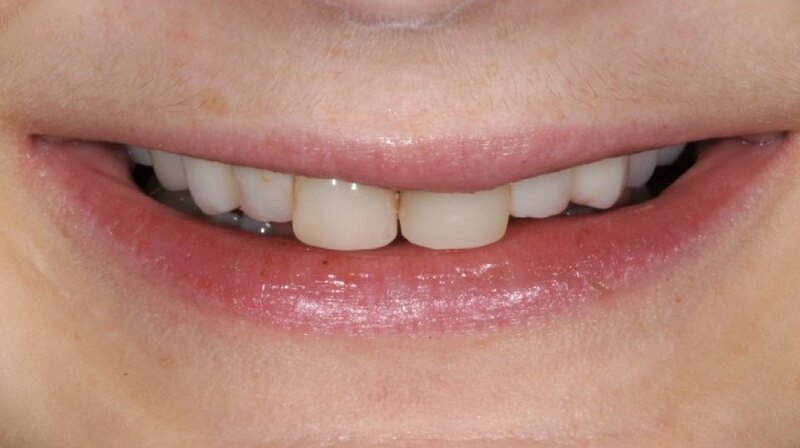 Fuller upper lip due to better lip support from crowns and fixed partial dentures. Clinical result, en face. Fuller upper lip. Showing more teeth. Plastic stent made for the patient to wear at night to prevent movement of teeth in relation to implants. 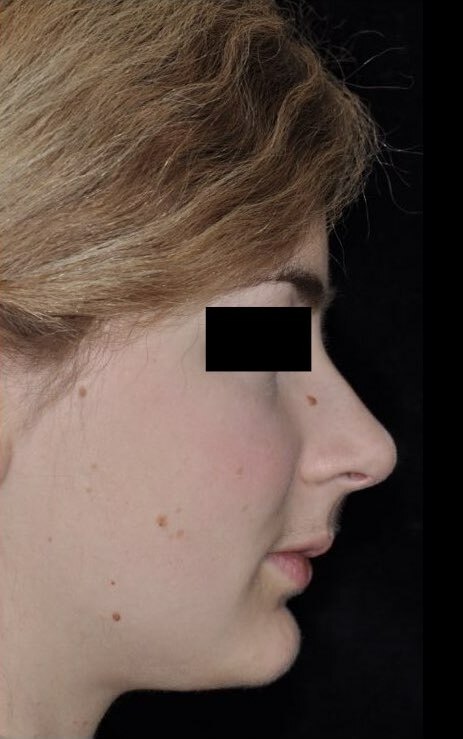 Clinical result, profile. Better support from prosthetics gives the profile a fuller look. Even her lower lip looks more prominent after treatment. 1-year follow-up, first quadrant. Titanium collar of angulated Multi Unit Abutments less visible. Grey shading on the buccal mucosa less visible. 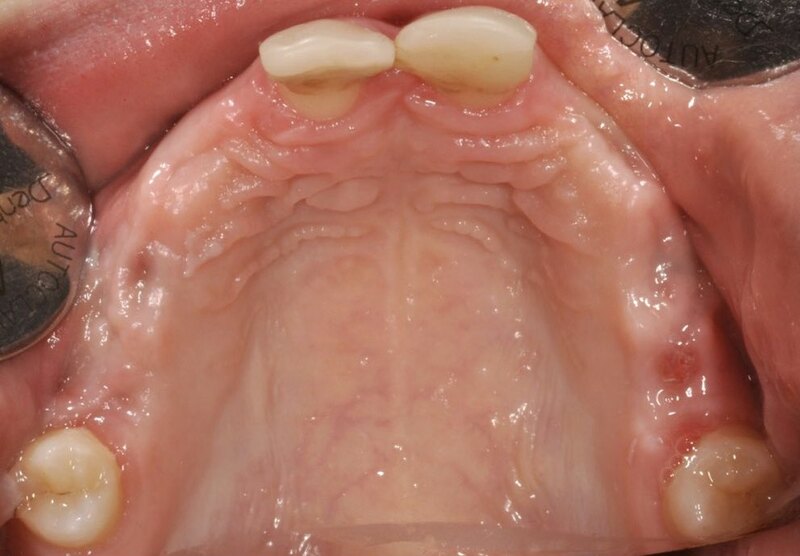 Mucosa/gingiva at pontic #12 FDI (#7 US) well shaped. 1-year follow-up, second quadrant. Hardly no titanium collar visible #23 FDI (#11 US). Slight grey shading #23 FDI (#11 US). Mucosa/gingiva at pontic #22 FDI (#10 US) well shaped. 1-year follow-up. Black triangle between #11, #21 FDI (#8, #9 US) may be a little less visible but is still there. 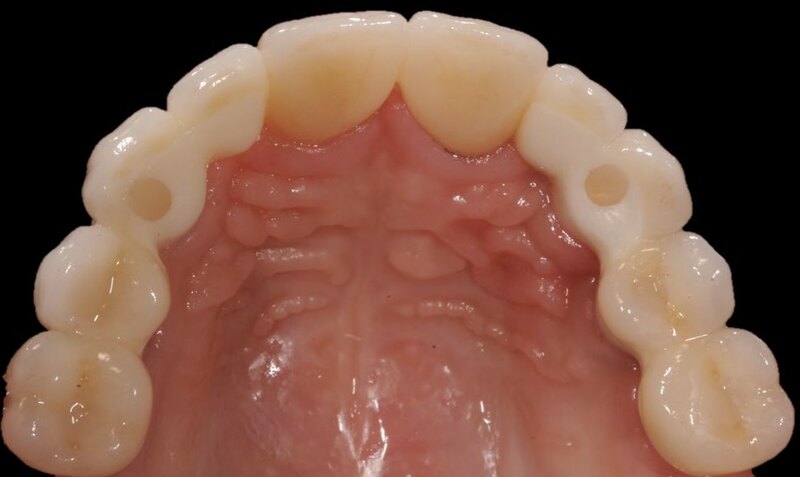 Mucosa/gingiva at pontic #12, #22 FDI (#7, #10 US) well shape. 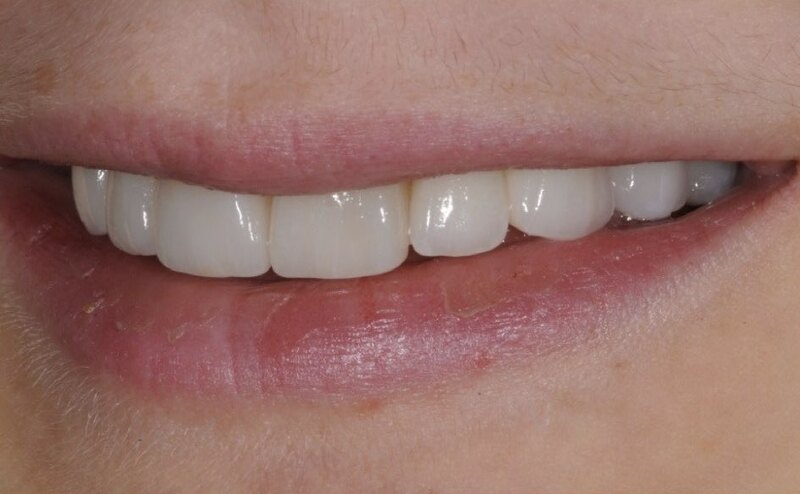 1-year follow-up, low lip line. 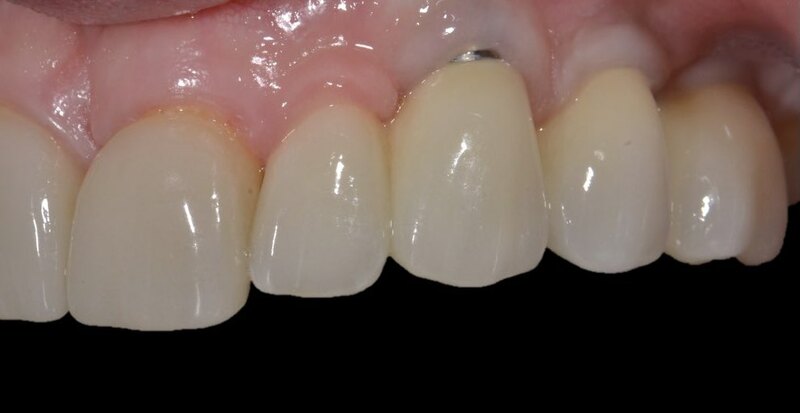 #11, #21 FDI (#8, #9 US) slightly elongated in relation to implant fixed partial dentures. Patient is not conscious of this. 1-year follow-up, profile view. 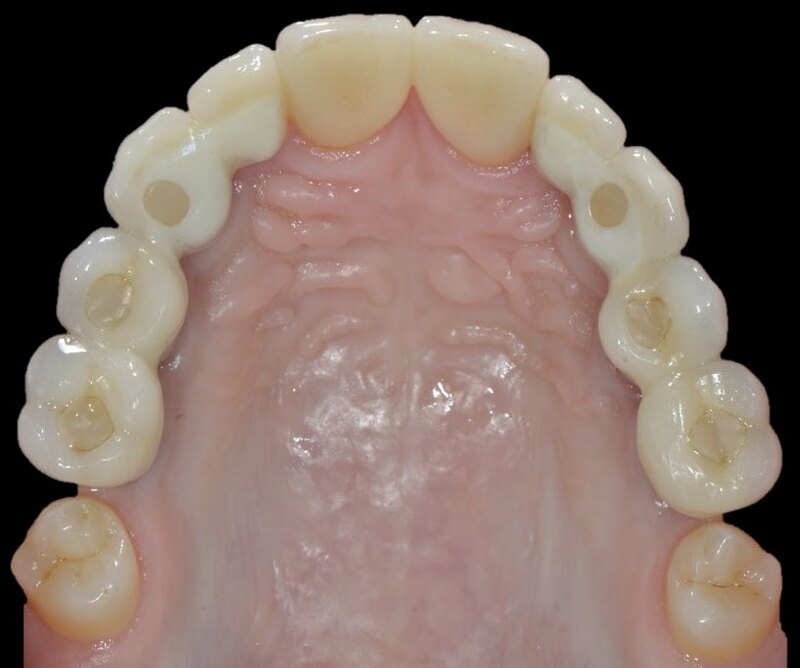 #11 and #21 FDI (#8 and #9 US) slightly elongated in relation to implant fixed partial dentures. Patient is not conscious of this. 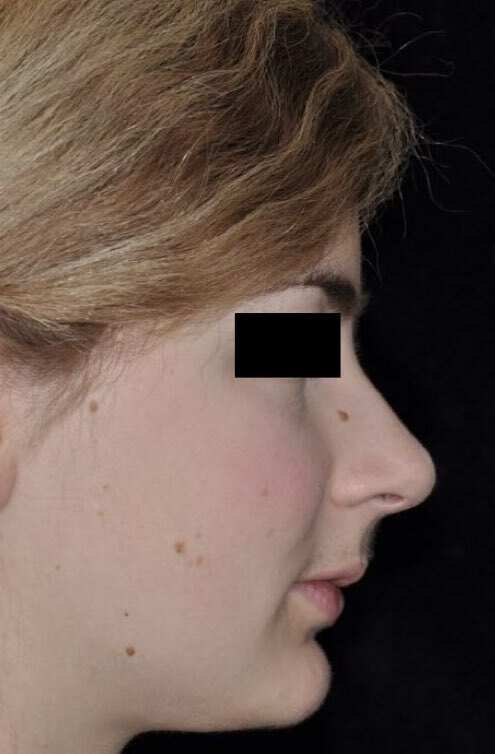 1-year follow-up, frontal view of full face. Fuller upper lip. Showing more teeth. 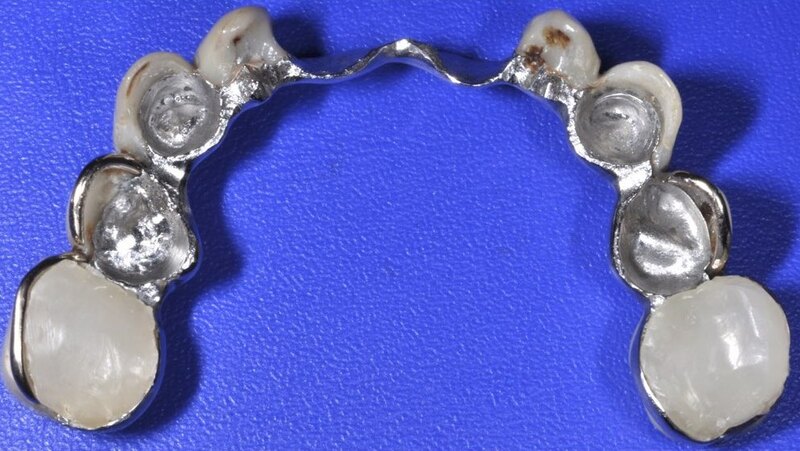 Hard for patient to wear resin stent at night due to changes in tooth-implant position that altered fit. New resin stent was made. 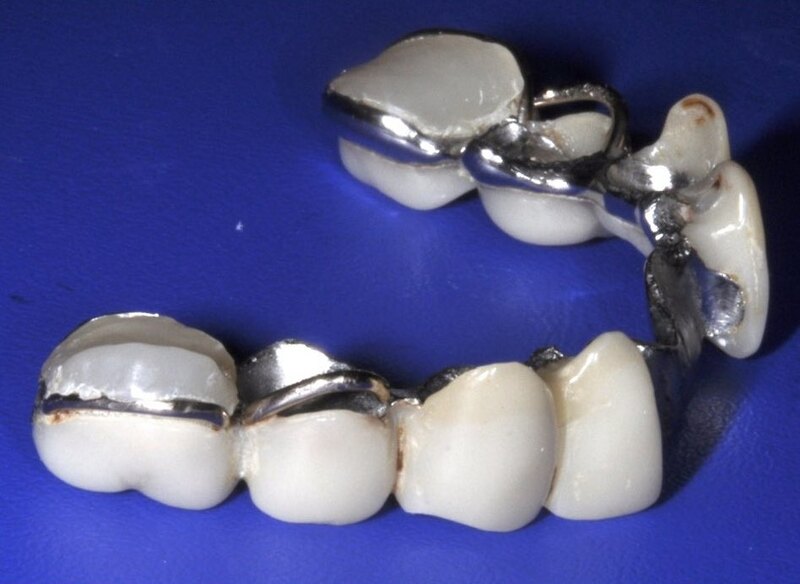 #21 FDI (#9 US) looks grey in comparison to the other teeth but is did not concern the patient. 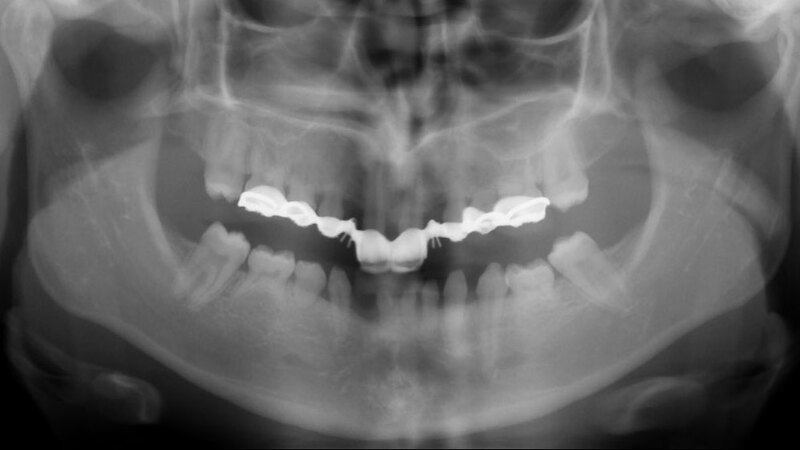 Panoramic radiograph, 5-year follow-up. Patient has been studying in another city why regular radiographs from check-ups are not available. Implants show stable bone levels without clinical signs of pathology. Primary tooth #81 FDI (P US) has exfoliated. Persisting primary teeth looks similar in root resorbtion compared to start radiograph. 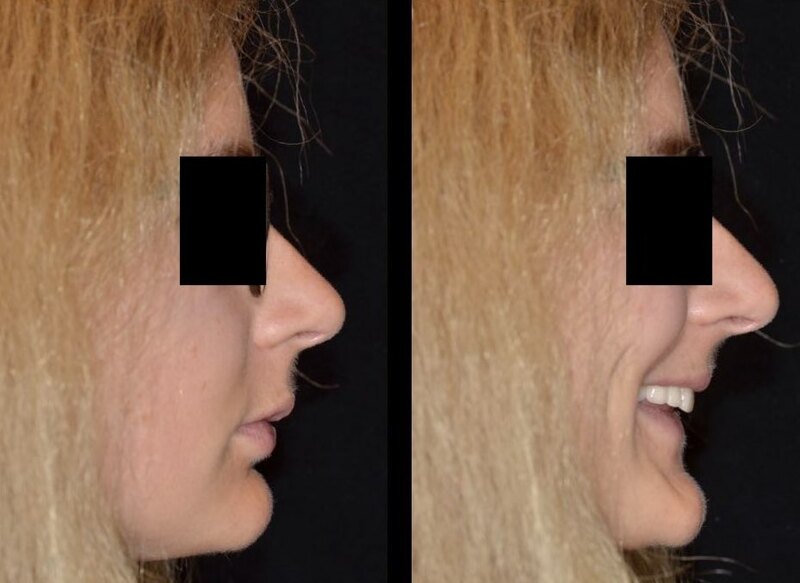 Patient interested in moving on with treatment in her lower jaw. Panoramic radiograph, 9-years previously. For control of progression of rosorbtion of lower primary teeth. 5-year follow-up. Upper jaw. Slight shrinkage and discolorations of occlusal composites in screw holes. No signs of ceramic fractures. Due to spontaneous eruption of teeth in position #16, #26 FDI (#3, #14 US) they are now in functional occlusion. 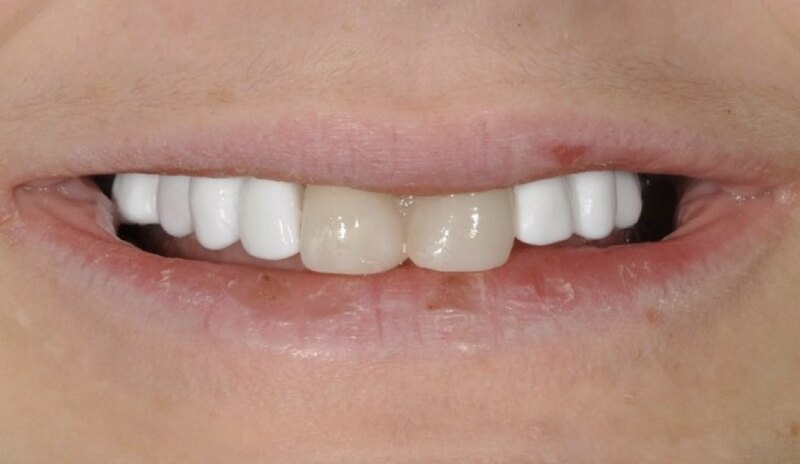 Since this treatment was performed on a relatively young individual, there will be long-term facial growth that might cause a difference in the incisal/occlusal position of the implant prostheses relative to the natural teeth since the teeth will move with future facial growth whereas the implants will not. The magnitude of this potential effect is unknown but the literature indicates such changes do occur even though the effect at 5 years is not noticeable. 5-year follow-up. Lower jaw. #81, #82 FDI (P, Q US) missing. 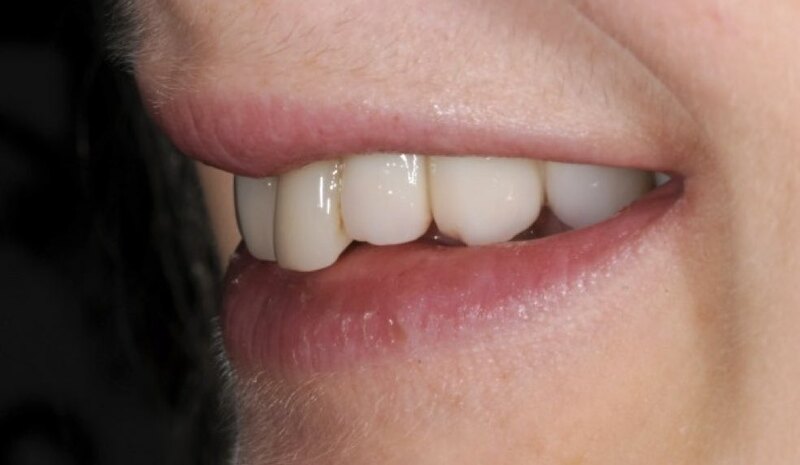 No major visible changes of wear of lower teeth or their position. 5-year follow-up. Soft tissue maturation and continued eruption of #11 and #21 FDI (#8 and #9 US). Titanium and grey shading still visible supra mucosally on implant #13, #14 FDI (#6, #5 US). Healthy mucosa. Good adaptation mucosa/pontic. Further elongation of #11 and #21 FDI (#8 and #9 US) visible. 5-year follow-up. Soft tissue maturation. Titanium and slight grey shading still visible supra mucosally on implant #23 FDI (#11 US). Healthy mucosa. Good adaptation mucosa/pontic. Further elongation of #11 and #21 FDI (#8 and #9 US). 5-year follow-up. Soft tissue maturation. No black triangle left between #11 and #21 FDI (#8 and #9 US). Mucosa/gingiva at pontic #12, #22 FDI (#7, #10 US) nice shape. Further elongation of #11 and #21 FDI (#8 and #9 US). 5-year follow-up, low lip line. 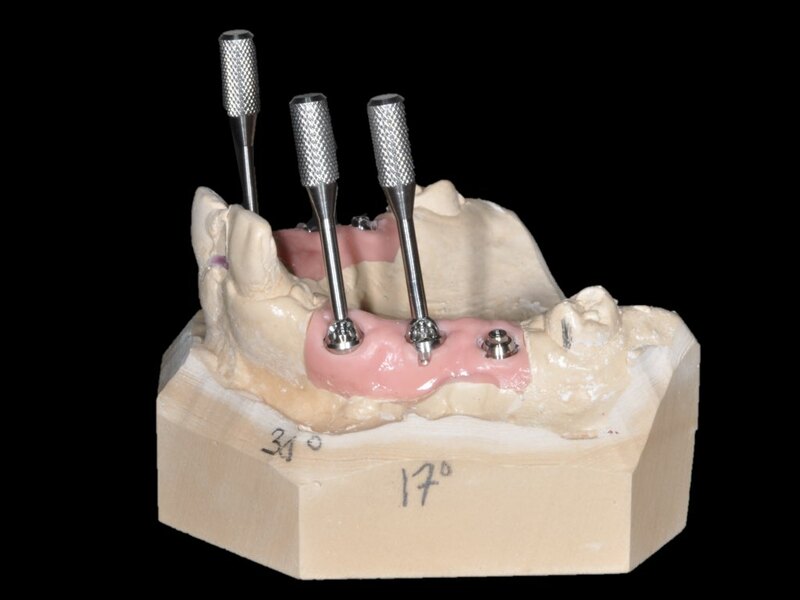 #11 and #21 FDI (#8 and #9 US) further elongated in relation to implant fixed partial dentures. #21 FDI (#9 US) looks grey in comparison to the other teeth. Patient has no concerns about this. 5-year follow-up, en face. Fuller upper lip. Showing more teeth. Plastic stent made for the patient to wear at night is not being used since it does not fit. #21 FDI (#9 US) looks grey in comparison to the other teeth. Patient has no concerns about this. 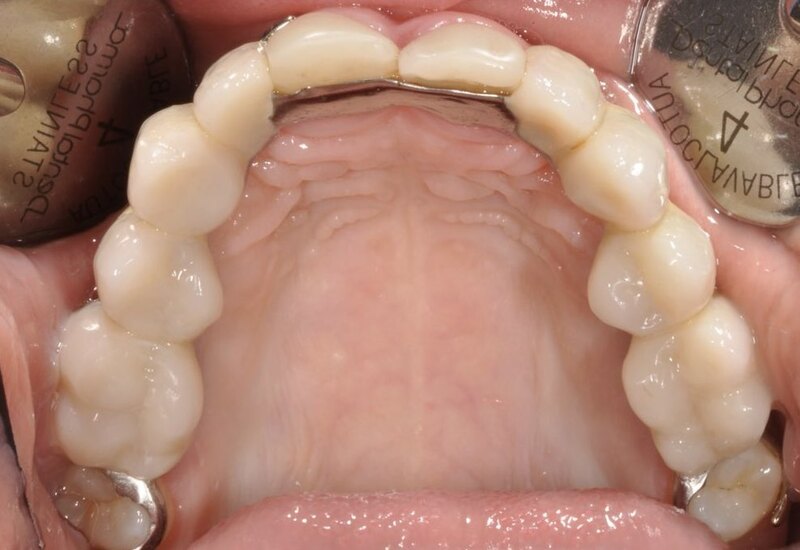 Since this treatment was performed on a relatively young individual, there will be long-term facial growth that might cause a difference in the incisal/occlusal position of the implant prostheses relative to the natural teeth since the teeth will move with future facial growth whereas the implants will not. The magnitude of this potential effect is unknown but the literature indicates such changes do occur even though the effect at 5 years is not noticeable. 5-year follow-up, profile. Better support from prosthetics gives her profile a less hollow look. When smiling her lower lip could use some more support. Treatment in the lower jaw is being planned.